Last week at Experiments in Manga the winner of the Miss Kobayashi’s Dragon Maid manga giveaway was announced. The post also includes a list of some of the manga available in print in English which feature dragons. Also posted last week was a guest review by my friend Jocilyn. She was inspired to write about Canno’s Kiss & White Lily for My Dearest Girl, Volume 1, the most recent yuri manga to be released by Yen Press. As mentioned previously, I’m currently working on my own in-depth review of the first volume of The Girl from the Other Side: Siúil, A Rún by Nagabe. It looks like I should be on track to post it sometime next week. Elsewhere online, Seven Seas has completely revamped its website, adding new features like browsing by genre, launching a newsletter, and so on. It looks great and what’s more, there will be a regular survey which provides readers an opportunity to give feedback and submit license requests. As part of the launch of the new website, Seven Seas also announced a few new licenses: Touki Yanagimi and Youhei Yasumura’s Anti-Magic Academy: The 35th Test Platoon, Shin Mashiba’s Yokai Rental Shop (I loved Mashiba’s Nightmare Inspector, so I’m really looking forward this one), and an omnibus of Fumiyo Kouno’s In This Corner of the World (Kouno is the creator of Town of Evening Calm, Country of Cherry Blossoms which is also excellent). 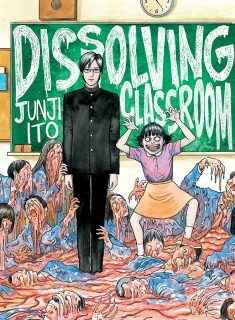 Dissolving Classroom by Junji Ito. 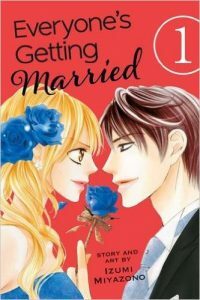 Lately there has been a resurgence in manga by Ito being released in English. In many cases they’ve actually been re-releases, but there have been a few newly-translated manga being published as well, Dissolving Classroom from Vertical Comics being the most recent example. I love Ito’s brand of horror manga and Dissolving Classroom was originally serialized in a josei magazine, so the volume was an obvious candidate for one of my most anticipated releases of the year. As expected, I thoroughly enjoyed the manga, but Dissolving Classroom didn’t end up leaving as strong of an impression on me as some of Ito’s earlier works. The loosely connected stories in Dissolving Classroom follow the demise of the people who meet Yuuma, a young man whose constant apologizing will literally make a person’s brain melt, and his incredibly creepy little sister Chizumi. Neither of the siblings are quite what they initially seem. Yuuma in particular comes across as a troubled but largely benign individual; very few people actually realize what’s going wrong before it’s too late. Dissolving Classroom is bizarre but certainly not the strangest manga that Ito has created. The visuals aren’t as shockingly memorable as some of Ito’s other series either, but they are still successfully disconcerting. 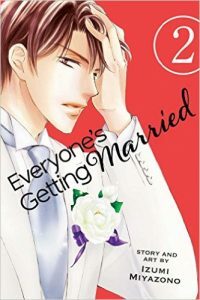 Everyone’s Getting Married, Volume 1 by Izumi Miyazono. 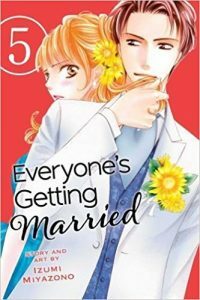 While josei manga have recently become more common in translation (a trend that I would love to see continue), there still aren’t all that many to be found. 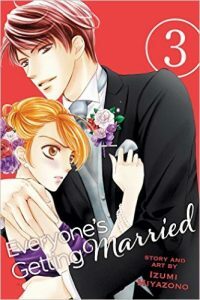 I’ve generally enjoyed the josei manga that I’ve read in the past and I like to show my support for new releases, so I made a point to try Everyone’s Getting Married. 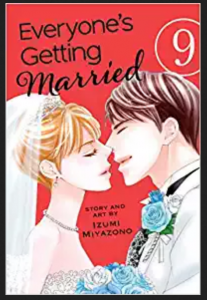 Asuka is well-admired for her successful career, but what she really wants in life is to get married and become a housewife. When her boyfriend of five years unexpectedly dumps her, she suddenly finds herself looking for a new long-term relationship. That proves to be more difficult than she expected and unfortunately for her most likely candidate is Ryu, a man who has made it very clear that he has no interest in marriage. I’ve growing a little weary of high school romances, so I found Everyone’s Getting Married to be a wonderfully refreshing change of pace; I enjoyed reading about adults and their lives and relationships for once. I also like Asuka a great deal. She’s independent, knows what she wants out of life, and is willing to work hard for what is important to her. I’m looking forward to reading more about her and reading more of Everyone’s Getting Married. Ghost in the Shell, Volume 1.5: Human-Error Processor by Masamune Shirow. While I had previously read the first and second volumes of Ghost in the Shell, I had never actually read the manga’s third volume, something that I didn’t realize until Kodansha Comics recently re-released the entire series in a deluxe, hardcover edition. 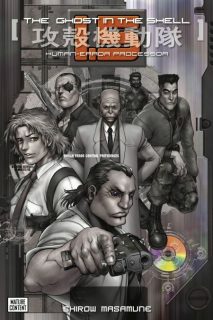 Even though it was the third volume of Ghost in the Shell to be collected and released, the events of Human-Error Processor take place between the first and second volumes (thus being numbered 1.5). The episodic chapters focus almost entirely Section 9 and the cases that group is investigating. A few intriguing new characters are introduced, but sadly the Major only makes the occasional guest appearance. Out of the three Ghost in the Shell volumes, Human-Error Processor is the most straightforward and easy to follow. While that’s something that I would generally welcome, the volume was somehow less interesting as a result even if it was more readable. As with the previous volumes in the series, some of the most interesting parts of the world-building in Human-Error Processor are actually only found in the footnotes instead of being directly incorporated into the manga. Nightlights by Lorena Alvarez. It was the bold, vibrant colors and gorgeous illustrations of Nightlights that initially caught my attention. 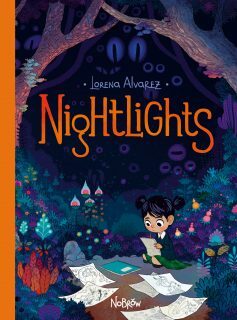 Alvarez is a Columbian illustrator; Nightlights is her first comic and my introduction to her work. Nightlights is about a little girl, Sandy, whose imagination takes flight at night. She gathers together small, mysterious, glowing lights and uses them to create anything that she can dream of. Come the day, she spends her time alone drawing what she has seen. It’s an innocent enough premise, but Nightlights can actually be pretty dark and some of the comic’s themes are fairly heavy. Nightlights could be described as an all-ages comic, but some younger readers might find it scary in places. There is also a depth and nuance to the comic and its narrative that only more mature readers will likely pick up on. Although the stories are notably different, Nightlights actually reminded me a little bit of the animated film The Secret of Kells which I likewise greatly enjoyed. Each in their own way the works are fairytale-like, telling stories about imagination, creation, and the unknown. Nightlights was a beautiful comic and I sincerely hope to see more work from Alvarez in the future. 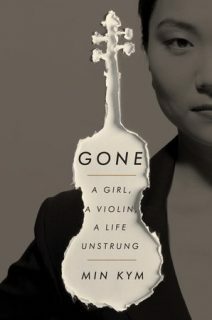 Gone: A Girl, a Violin, a Life Unstrung by Min Kym. In 2010, Kym’s Stradivarius was stolen from her in a London cafe. The violin was an integral part of her identity, not just as a musician but as a person, and its loss was devastating. Her burgeoning career as a soloist came to a sudden halt. The violin was recovered three years later, but circumstances didn’t allow Kym to reclaim the instrument as her own. Ultimately she had to put it up for auction, losing it once again. In part, Kym’s memoir Gone was written in an attempt to process these traumatic events, rediscover who she is, and move forward with her life. Telling her side of the story she recounts growing up as a child prodigy–as the youngest daughter, her family’s devotion to her talent as a violinist was at odds with their South Korean heritage–her development as a musician, and her relationships with the Stradivarius and the people around her. Gone is an incredibly heartfelt and personal memoir but it can be somewhat discursive; Kym’s style of writing is very informal and at times even chaotic. Her voice as an author isn’t as clear as her voice as a violinist, but her passion and pain resonates throughout Gone. Complementing the release of Kym’s memoir is a companion album available from Warner Classics.